Stow is a Green Community, and not just because of its wonderful forests. Stow was given the Green Community designation by the state’s Green Communities Program in 2015, for efforts toward making Stow a more energy-efficient, sustainable community. The Stow Energy Working Group, which sought the Green Communities status on behalf of the town, is moving forward with a new name – Sustainable Stow – and calling for new members. Brownfield and Sustainable Stow members Ann Deluty and Carol Lynn recently met with the Independent to talk about the accomplishments of the committee and its work for the Town of Stow. Brownfield explained she and Arnie Epstein formed the original Stow Energy Working Group in 2007, gathering other interested residents to address issues of energy efficiency in Stow, in cooperation with Town administration. Brownfield, Deluty and Lynn reviewed some accomplishments of the group. The original group got off to a great start by leading activities focused on reducing individual and community energy consumption in Stow. In the Stow Solar Challenge, 276 households inquired about solar and 59 had solar installed. This initiative was so successful that the town received a free solar array for the town building from the contractor. The group has facilitated energy audits of municipal buildings, educational forums on home energy savings, home solar power, electric vehicles, and residential heat pumps. Brownfield recalled partnering with Clark University students to assess the viability of wind power use in Stow. That study indicated Stow lacks enough wind to make wind power a feasible option in town. “It has been very exciting to be working in a community that is committed to building a resilient and sustainable town. We would not have been able to have a successful solarized program or Green Communities application without the help of town residents and support from town officials,” said Brownfield. Brownfield related that the Green Community designation enabled a grant of $144,000 for municipal energy efficiency projects, such as new lighting for the library, and a new cooling and heating system for the police station. 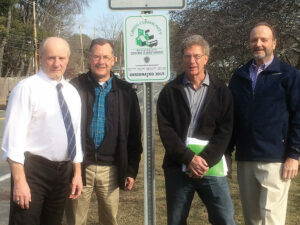 As a Green Community, the town became eligible to apply for further grants. Under its new moniker Sustainable Stow, the committee isn’t resting on its laurels. “Sustainable Stow plans to apply, jointly with the town of Hudson, for the Massachusetts HeatSmart grant, to educate residents and encourage them to move to more energy-efficient heating systems,” said Brownfield. The grant, if awarded, would provide funds to help the committee educate and assist residents in transitioning to small scale clean heating and cooling technologies, such as air-source or ground-source heat pumps. Possible ideas for future projects include reducing carbon footprints through energy efficiencies in electricity use, heating, and transportation, promoting a clean environment at home and in the town by reducing use of chemicals, single-use plastics, and other waste. “We are also open to ideas community residents might have for other programs or areas on which we could work,” agreed Deluty, Brownfield, and Lynn. “I believe in the future, and I believe we can shape the future, and we need to,” added Deluty. The Sustainable Stow website offers tips about how residents can reduce their carbon footprint and support a greener environment. “Core members include Sharon Brownfield, Ann Deluty, Arnie Epstein, Rick Lent, Carol Lynn, George Peterman, John Sangermano, and Sandy Taft, with others who volunteer on some activities,” said Brownfield. “Sustainable Stow is a ‘town working group’ reporting to Bill Wrigley, Town Administrator,” noted Epstein. Residents interested in learning more or joining Sustainable Stow can visit sustainablestow.org and link to the Get Involved page, or use the Sustainable Stow link on the Town Website.